Eugene Laverty will move back to World Superbikes in 2017. Northern Ireland’s Eugene Laverty will lock horns with fellow countryman Jonathan Rea in the World Superbike Championship in 2017 after confirming he will make the switch from MotoGP. The Toomebridge man has been in sensational form this season in the premier class on the Aspar Ducati, sealing his best ever finish of fourth place in Argentina and taking sixth last weekend at Brno in the Czech Republic to hold 11th place in the standings. Laverty, though, has opted to move back to World Superbikes, where he finished as the title runner-up in 2013 in the official Aprilia team. The 30-year-old will ride a factory Aprilia with backing from Milwaukee and says he is focused on becoming world champion next year. The team will be run by Shaun Muir Racing. Ulsterman Rea is the reigning WSBK champion and is on course to retain his crown this season and Laverty admits the Kawasaki rider will will be difficult to beat. “Next year is going to be very exciting. 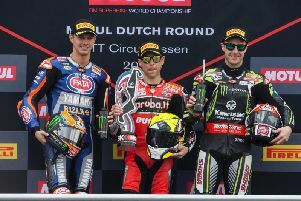 There are a lot of strong riders now and there will be even more next year, with Stefan Bradl coming across [from MotoGP] and me moving back,” he said. Laverty, who raced in World Superbikes between 2011 and 2014 – clinching 13 race victories and 33 podium finishes from his 104 race starts – says he is highly motivated to return to the class and challenge for the championship. “I am excited to return to World Superbike with Aprilia. I’ve had a lot of success there, it was a great period,” Laverty said. “During my two years in MotoGP I have learned a lot; there’s been some difficult times, of course, but I have improved a lot as a rider and I’m looking forward to this next stage in my career. Shaun Muir Racing entered the World Superbike Championship for the first time this year with Josh Brookes and Karel Abraham riding BMW machinery. However, both have struggled for form on the S1000RR and SMR's switch to Aprilia with Laverty next season should provide a dramatic upturn in fortunes. Laverty will be joined in the Milwaukee Aprilia team by Italy's Lorenzo Savadori, who has been impressive on the Ioda Aprilia this year. The easy-going Northern Ireland rider also competed in the World Supersport Championship for three seasons from 2008 to 2010, finishing as the runner-up in 2009 by seven points behind Britain’s Cal Crutchlow. He also went close to the title the following year, with Kenan Sofuoglu prevailing by only 11 points.